You may schedule an appointment by phone by calling 859-C-SMILES or by using our online appointment request form. New patients, dental emergencies, and walk-ins are welcome. Where are you located in Lexington, KY? 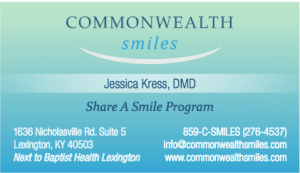 Commonwealth Smiles is located at 1636 Nicholasville Road, Suite 5, Lexington, KY. Visit our Contact & Location page for more information. You may always call 859-C-SMILES to double check the specific time and day of your appointment. Early morning and after hours appointments are available upon request. Please see our Contact & Location page for more information. See calendar for more details. Where can I learn about different dental treatments? A guide to dental services offered at our Lexington, KY dental office is available by visiting our Dental Services page. Under each heading there is additional information to learn more about each treatment. Where can I learn about dentures? A guide to dentures is available by visiting our Dentures Guide page. Under each heading there is additional information to learn more about each treatment. With which Kentucky dental insurance networks does Commonwealth Smiles participate? Our office is happy to help you file insurance claims with ANY dental insurance plan! 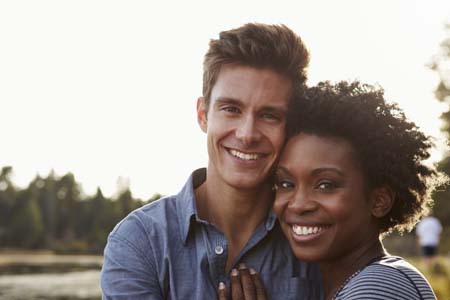 We encourage you to be familiar with your specific plan; please check with the provider of your dental insurance plan for up to date coverage and benefits information, as things frequently change. To see which dental insurance networks your Lexington, KY dentist Commonwealth Smiles is in, please download our Dental Insurance information Guide. We want to be your affordable Lexington, KY dentist of choice. Please visit our Financing Options Guide for more information. We want your first appointment at Commonwealth Smiles to be a comfortable one. To find out exactly what you might expect. Refer a new patient to our office and after completion of their dental treatment, you will receive a $20.00 credit toward future dental treatment! Print out these cards and don’t forget to write your name and turn them into us at your next visit!